Eric Oakland is a co-founder, producer, and scribe artist at TruScribe, a video scribing and whiteboard animation company with talents in storytelling, conceptual thinking, story boarding, videography, & graphic design with clients like Microsoft, HP, and Paypal. You can follow them on Twitter at @TruScribeVid. You’re familiar with the rise of video over the last 4 years and if you’re here at Wistia.com, you’re probably on top of it. Also on the rise is the use of markers, pens, tablets and drawing instead of technology, PowerPoint in particular, in many areas of business. With whiteboard selling in sales, graphic facilitation at a conference, or Dan Roam’s Back of the Napkin series as examples, drawing is great for visualizing an idea and connecting with people. Video scribing is a new method in the mix of organic message delivery. Also referred to as whiteboard animation, it lifts that drawing from its fixed place and time, and allows it to be uploaded, broadcasted and shared. Many are wondering how they can use video scribing in their organization, and there are really only a few video type limitations. It’s hard to beat a “talking head” video when interviewing someone important, and I usually don’t recommend trying to scribe your software interface when a “screen-capture” video would do better. But every day, scribing is used to communicate and sell ideas. First, video scribing is great for telling a story about how your product or service fits into your customers’ lives and improves their experience. This could include an introduction to your company, a brief explanation of your product, or a guiding philosophy that sets you apart from the competition. These videos are often more “you content” than “them content”, so keep it short. 60-90 seconds. Once you’ve told your top-level story, whiteboard videos are perfect for diving a bit deeper into specific product, process, or service explanation. Initially your viewers aren’t looking for complex information. But if they watch your first video and keep clicking through, they are a more interested buyer. Then, 2-5 minutes of detailed information may be exactly what they are looking for. Video scribing, if done well, can make even the most complex information easy to consume. Now maybe you’re looking for something with a little more sharing power. For this your content needs to include more “them content”, information that your customers find highly valuable: “insider” industry trends, tricks of the trade, or timely reports. 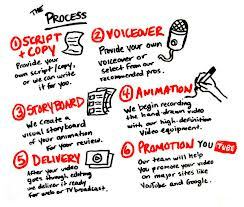 You may be used to turning to whitepapers for this but video scribing is an engaging and entertaining alternative. Another popular and highly sharable piece of media is the infographic, graphics that lay out all the information about a topic and show side-by-side comparisons of stats and graphs. The use of highly entertaining graphics and visuals allow a user to look at and read these documents for minutes. But they are static and still force the viewer to decide where to start, and how to interpret the data. With a whiteboard animation, an infographic turns into an info-MOTION-graphic and you join the delight, seeing graphically-explained data that moves. If your company has an eLearning database of video and other media, I don’t have to tell you the merits of it. But those merits are only realized if you candevelop content that people are eager to watch, that delivers information in a memorable way, and can be applied to any topic. Video scribing can deliver lesson or scenario-based stories on topics ranging from employee policies around the office to how industry regulations affect employee work. 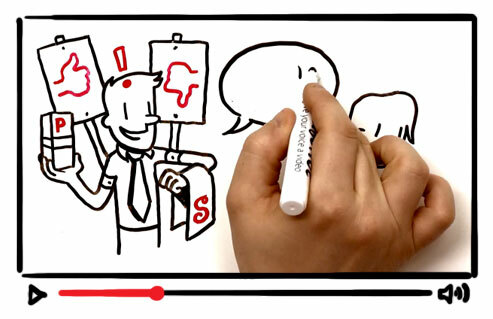 Whiteboard animation has also been used to share ideas about education, motivation, and social environments that are meant to affect viewers thoughts and influence change. When you’re dealing with things that aren’t a reality yet, you can only use the imagination to show the viewer what is possible. Whiteboard animation isn’t limited to stock video or photography, and can reach farther into the imagination with much less work than a Hollywood production. Can The Cartoonish Style Of Video Scribing Be Used For Serious Topics? The first time I was asked this was when talking to a representative of BALPA (British Airline Pilots Association) about the issue of tired pilots and regulation that was going to force pilots to fly more hours. But if you think about political cartoons, or even comic strips in the newspaper, sometimes it’s the cartoon format that allows viewers to open up to a new idea. Will A Whiteboard Video Fit With My Company’s Branding? The answer is no. A whiteboard and dry erase marker may not fit your rugged or high-tech brand. So think outside the whiteboard. Dirty charcoal on torn paper could be perfect for a outdoorsy or edgy brand. Napkins and marker might work for a café or boutique brand. And if you’re looking to show that your brand is innovative and fresh, right now’s a good time to work video scribing into your content offerings before they are everywhere and go from being new and interesting to just interesting.